Find a place to rent or find a roommate in the UK. FlatmateRooms is an established UK community marketplace introducing landlords and property owners to trusted flatmates and tenants looking for better places to live. 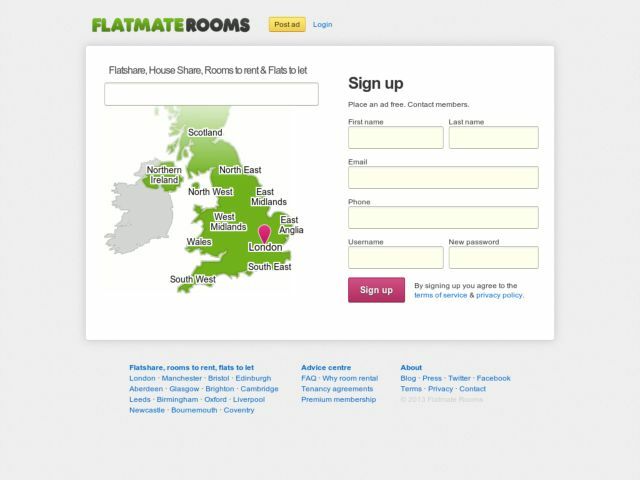 Flatmate Rooms is a place to find a flatshare, flatmate or rent a flat in the UK. Website is hosted in London. Code is written entirely by Frank Malina, co-founder and a very happy Django user and contributor. That[HTML_REMOVED]s us, Flatmate Rooms: Rooms to rent, house shares [HTML_REMOVED] flats in London, Edinburgh, Manchester and all over the UK.